I am not the person my grandma thinks I am. Wait…what? Yeah, you heard me. I, myself, am not as good of a person as my grandmother thinks I am. In her eyes, I’m still little a little kid with dimples and a bowl cut hairstyle, innocent and practically sinless…but I am not that person. I still fall short of the glory of God on a daily basis. If you were honest with yourself, you would say the same thing. Sadly, I break his law everyday, and so do you. (If you are unsure if you have sinned today, read Jesus’ summary of the Ten Commandments—including loving the Lord your God with all your heart—in Matthew 22). I have not loved the Lord my God consistently all day today. 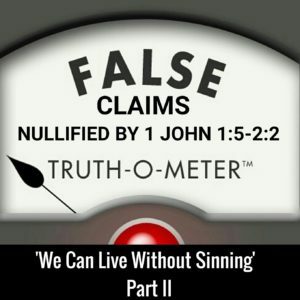 Now that I’ve gotten that off my chest, lets look at how John deals with people who make false claims of being sinless, and the truth that delivers us from that falsehood. John is dealing with false teachers in Ephesus, one of which must have claimed they were at a point in their life where they were without sin. This isn’t a forgotten teaching, as several denominations still make these claims today. John speaks to their situation. He declares that if we claim to be without sin, it doesn’t mean we are sinless, it means we are deceiving ourselves. In other words, we’re lying. John says ‘we,’ so he is clumping himself in with the people that he is writing to, in order to say that if you (or I) ever claim to be perfect, we are perfectly deceived. John’s emphasis in verse 8 is on how adamant these people are claiming to be without sin. They are really convinced (deceived) that they have obtained sinless perfection. God saved him and changed his desires, but there were still times when he felt like he didn’t have the ability to carry out his God-given desires for holiness. If you have been a Christian even 10 minutes, you’ve found yourself in the same boat as Paul. AW Pink points out that it is not the absence of sin but the grieving over it that distinguishes the child of God from empty professors. Notice how John delivers us from this deception in verse 9. John writes that, if we confess our sins, God is faithful and just to forgive us our sins and to cleanse us from all unrighteousness. So, only the deceived claim to be without sin. The only other person that would believe you to be sinless is likely your grandma. Just because someone may love us and refuse to believe anything bad about us, doesn’t mean that we actually are perfect. Now that we’ve established everyone’s status of “sinner,” what do we do with our sins? Confess! The remedy to our sinfulness is confession. A definition of ‘confessing’ is that we agree with the truth. God knows that we sin, even as Christians. Nothing is hidden from Him, and even the lost world around us understands, to an extent, that we miss the mark. The answer to our sin problem is confessing our sins to a God who knows they are there and sent His son to die in our place for those sins. In one sense, this verse shows us that we have been perfected by Christ’s offering. In another sense, there is a continual process of being made holy that is happening to us (note: ‘sanctified’ here is a passive verb in the present continual tense, so it is something that happens to us over a continual process). Here’s what this means for us: proof that we have been saved by Christ is looking more like Him the longer we walk with him. That’s what we must test inside ourselves, are we looking more like Jesus the longer we are with Jesus?